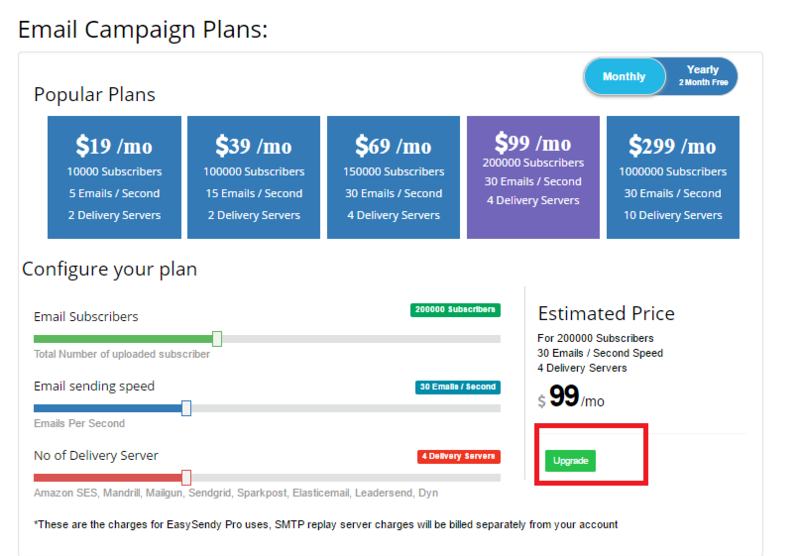 You can easily upgrade your EasySendy Drip (or EasySendy Pro) subscription from lower to higher plan through EasySendy Drip (or EasySendy Pro) account from EasySendy Drip (or EasySendy Pro) dashboard. After that choose/ configure the new plan according to your new need to which you want to upgrade and click on “Purchase” button, and finally make payment. After successful payment; your account will be upgraded instantly. Note: The upgrade and downgrade of a plan cannot be done on a price difference. You need to pay the total amount for upgradation. You will be charged only for the number of days you have used the old plan before upgrading.The rest amount will be refunded to you.